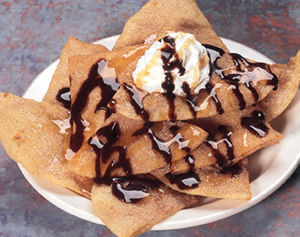 Crisp flour tortilla chips, sprinkled with powdered sugar & cinnamon; served with honey or chocolate syrup or both! Garnished with whipped topping. Strawberry, Bavarian Cream or Plain. Deep fried, rolled in cinnamon, topped with whipped cream and a cherry. Crunchy coated ice cream. Flash fried, topped with a cloud of whipped topping.